Love is in the air! Why wait until Valentine’s Day to wear these? 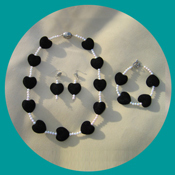 Necklace, bracelet, & earring set made with black velvet hearts, costume pearls, and antique silver clasps. Designs for the classy woman! 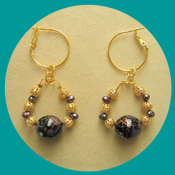 Earrings made with European & gold filigree beads, freshwater pearls. No matter what your faith – express yourself! 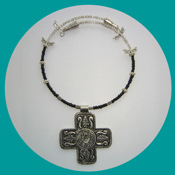 Necklace made with antique cross pendant, glass & metal dragonfly beads. Designs created to make you feel like you traveled across the globe to buy them! Mixture of wood, stone, resin, yarn, and glass. Travel no further than here to wear a piece of the ocean collection! 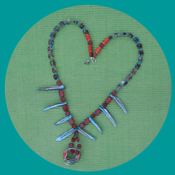 Necklace made with genuine dyed shell, Millefore glass, Austrian crystals, & ceramic beads. 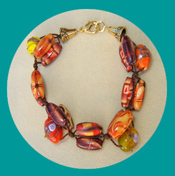 The glass collection is a mix of pastel and vibrantly colored beads made from all over the world! 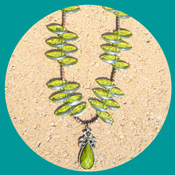 Necklace made with peridot glass, copper beads, & a costume pendant. Pieces inspired by the earth's natural beauty! 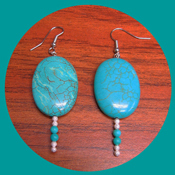 Earrings made with natural turquoise stones, & silver accent beads. This design is fun and chunky! 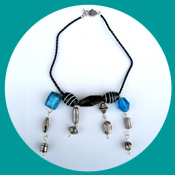 Necklace strung on a leather cord & made with large handblown glass & resin silver beads connected with wire. Reminisce to medieval times and here you will find a heavier, chunkier look. 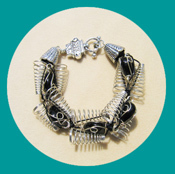 Bracelet made with wire-wrapped glass onyx beads, metal spirals, & antique silver clasps. 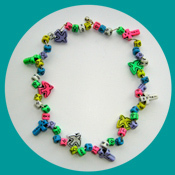 Jewelry from each of the Amelia moods is transformed into lively, funky, & dreamy styles for young girls from ages 5 – 15. Jewelry for young hearts & inspiring minds! Necklace made with plastic religious beads arranged on a spiral wire necklace. Jewelry commissioned for the woman who wants to convey exclusivity! Custom silver strand necklace made with rare 8mm sahara out-of-program Austrian crystals, glass pearls, sterling silver beads, and sterling silver clasps. 2" sterling silver drop earrings to compliment the necklace. 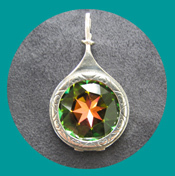 You will attract attention with this sterling silver 27mm pendant! 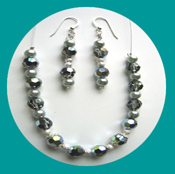 Austrian crystals can be interchanged to accent any casual style or dressy occasion. 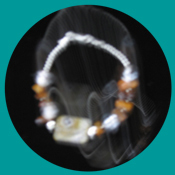 Click to watch pendant demonstration. 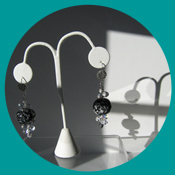 Jewelry Art by Amelia is an authorized distributor for these crystal pendants & earrings. For retail prices, please call 412-384-1792.Wholesale pricing also available.